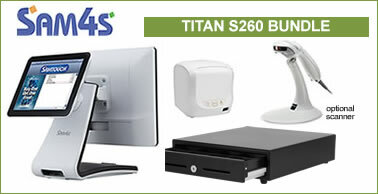 Our Hardware Bundle Deals provide you with all the equipment and accessories required for use with your own EPoS software. 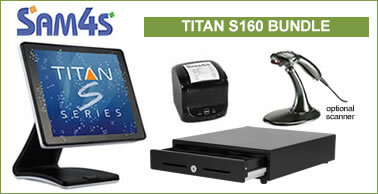 If you want a package with software and setup services, take a look at our popular EPOS Package Solutions. Additional discounts are available for volume orders and software developers - please contact us for an instant quote. 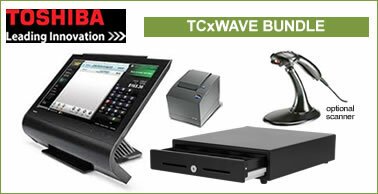 We can also configure bundles with your choice of peripherals and terminal specification. 15" touch screen terminal with capacitive touch screen technology. High gloss luxurious finish. 15" TFT LCD with Projective Capacitive Touschreen, 2gb RAM, 64gb SSD, Intel Celeron Dual Core N2807 2.16ghz Processor. Windows 10 IoT pre-installed. 3 years warranty. Options: Rear Customer Display (2 line or 9.7"), Magstripe Reader, Barcode Scanner. Options to upgrade to 4gb memory, upgrade to 128gb SSD - please call for pricing. 15" touch screen terminal with waterproof flat front panel. PCT Projected Capacitive Touch technology. High gloss luxurious finish. Intel Celeron N3160 Quad Core 2.24Ghz fanless processor, 2Gb memory (upgradable to 16gb) and 64gb SSD. Windows 10 IoT licence pre-installed. 3 years warranty. Options to upgrade to 4gb, 8gb or 16gb memory and 128gb SSD - please call for pricing. A high-specification modern design terminal with SSD storage, waterproof front, fast processor, fast thermal receipt printer and sturdy cash drawer. Optional laser barcode scanner with stand and optional rear display. 15" touch screen terminal with capacitive touch screen technology. Intel Quad Core Celeron N3160 2.24Ghz processor, 15" TFT LCD with Projective Capacitive Touschreen, 2gb RAM, 64gb SSD. Windows10 IoT pre-installed. 3 years warranty. Options to upgrade to 4g, 8gb or 16gb memory and 128gb SSD. A neat, tidy design hardware bundle with integrated receipt printer and barcode scanner, so minimal components and cables, and minimal counter space required. with Dallas Key Reader and 2-line rear Customer Display as standard. 5-wire Resistive touch technology. Intel N3160 Quad Core 2.24Ghz Fanless Processor, 2gb memory and 360gb SATA hard drive. Windows POSReady pre-installed. 3 year warranty. 80mm width thermal receipt printer, built into the main chassis. 3 year warranty. Front opening drawer with 4 note and 8 coin sections, RJ11 printer interface cable, 2 media slots, 3-position key lock. 1 year warranty. Options to upgrade to 4gb or 8gb memory, upgrade to Windows 10 IoT - please call for pricing. Robust build quality, high performance specification and flexible configuration options in this top of the range Panasonic bundle with Epson thermal recept printer and steel-fronted cash drawer. with 5-wire Resistive touch technology. Intel Celeron P4500 Dual Core 1.86Ghz Processor, 2gb memory and 250gb hard drive. Windows POSReady pre-installed. 2 year warranty. A robust build terminal with advanced sleek design and powerful performance, sturdy receipt printer and full size cash drwer. Optional barcode scanner, optional rear display. 15" touch screen terminal, 2GB Memory, 64GB SSD storage. Preloaded with Windows POSReady. 1 year on-site warranty. The hardware bundles listed above do not include any EPoS application software. If you require a complete solution with hardware, peripherals and application software with services for programming and staff training, please see our Package Solutions. 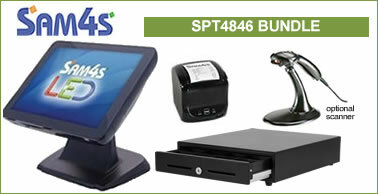 Our standard packages can be configured with your choice of alternative touchscreen terminal and other peripherals.